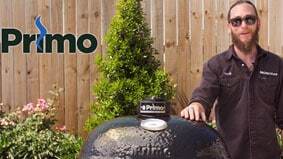 Primo entered the industry making a traditional round kamado-style grill, similar to the Big Green Egg. While these grills are very popular, Primo knew the design could be improved. They decided to combine the concept of a kamado-style grill with an innovative and versatile design, using premium materials. The Primo Oval was born, which is a best in class, revolutionary grill. The oval shape is more accommodating to large cuts of meat, in addition to large cooking pans. Free starter kit with select Primo grills! The patented oval design of Primo’s ceramic grill was created with two distinct cooking zones in mind. Two-zone cooking makes grilling things like meat and veggies at the same time a snap. You can cook your steak and chicken over direct heat while your veggies cook over indirect heat using a deflector. All Primo grills come with a limited lifetime warranty and are proudly made in the USA. Primo ceramic grills are available in built-in, freestanding, or portable configurations. They’re also available in three fuel types: charcoal, natural gas, and propane. There are multiple cooking grid size options ranging from 18.5 x 13.5 inches to 25 x 18.5 inches. Primo has several different collections to choose from depending on what’s most important to your grilling experience. Oval XL - Primo’s flagship grill gives you 400 square inches of cooking space, allowing you to cook up to 19 burgers at once. The patented oval shape gives you plenty of room to cook large meats and the split reversable cooking grids provide plenty of smoking and grilling versatility. Jack Daniels Edition Oval XL - This unique version of the Oval XL was made for those who love Jack Daniels. It displays the Jack Daniels logo beautifully and makes a nice centerpiece for your outdoor kitchen. Oval Large - This grill allows you to cook up to 13 burgers with 300 square inches of cooking space and the same great oval shape – including the split design found in the Oval XL. Oval Junior - The Junior is great for those of us who only cook up to 10 burgers at a time, with 210 square inches of cooking area. If space is tight, this is a perfect option as it has a smallest footprint of the Primo grills. Even though it’s smaller, it still has the split and reversable cooking grids for versatility in grilling and smoking. Large Round - For those who prefer the classic round design or need a grill to fit in a previously built-in space for a round kamado, this is a great option. It has 280 square inches of cooking area and can grill up to 13 burgers at a time. Unlike the oval version, this grill does not offer split zone cooking. Oval G420 - This grill combines the heat retention of a ceramic grill with the ease and simplicity of a gas grill. This revolutionary ceramic gas grill offers 420 square inches of cooking area or enough space to cook 20 burgers. It’s crafted with heavy-duty 304 grade stainless steel cooking grates and flavor grids. The two low temperature burners allow you to cook low and slow and the included smoker box gives you the wood smoked flavor of a kamado style grill.